Steve's earned a rep as one of the best comics around... Started touring in 1980 and has kept audiences laughing ever since. Comic Relief producer, Bob Zmuda: "One of the funniest I've worked with." Appearances on: The Tonight show with both Carson & Leno and on Letterman.. Led to Showtime (Laff-off Winner), HBO and on almost every standup show out there. Over 100. Corporate shows include: IBM - AMEX - Pizza Hut - The Red Cross - Minnesota Twins - Miller Beer - Toyota - Texas Instruments - Wayne Dalton Corporation - Nicholas-Flick Golf, Honeywell and many more. Seasoned: Steve headlines country clubs, casinos and private parties of all kinds: birthdays, anniversaries, fund raisers, weddings, bar mitzvahs and holiday shows. He can mc, customize material and work the crowd. Steve's also done numerous 12 Step events over the years ie. Yukaholics (LA) and many more. 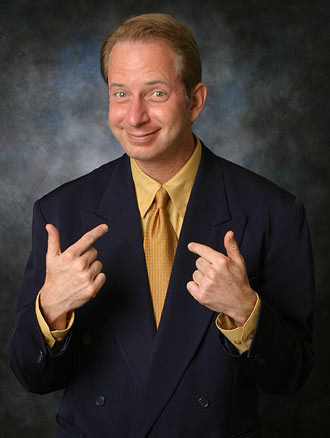 Steve's worked with: Leno, Seinfeld, Ray Romano, Drew Carey, Ellen, Roseanne, Dennis Miller, Bill Maher and many more. Tours include: Natalie Cole & Gladys Knight... Cruise lines: NCL, Royal Caribbean, Oceania and Regent. Vegas casinos : the MGM, The Red Rock, The Golden Nugget. Atlantic city: the Borgata, Resorts, The Sands and The Trop. Connecticut, Tahoe, Reno, Palm Springs and many Indian casinos. Routines On: traveling, newlyweds, marriage, dating, cruises, europe, la, sports, fishing, restaurants, his family, his ex, getting engaged, birthdays and being a class clown. When you hire steve, you'll hear more and be glad you did. Steve consented to be a star on ABC's extreme makeover: 'Who knew ABC stood for 'a bigger chin?' 'My worst fear? They cancel the show in the middle of my surgery.' This led to appearances on Larry King Live, ABC News and The Bob & Tom show. Steve's been on numerous sitcoms and in movies, ie. The beloved hit film 'Roxanne' (as Ralston, one of the funny firemen) with Steve Martin... And about 50 national commercials. Mittle-math: Steve's honed his skills over 25 years, thousands of shows and millions of laughs. Let's talk and see how we can make your occasion a great one with lots of funny memories. Steve will definitely add laughs.